- 24-Apr-2019 ZKC-LDH-163 Induction training of under CRA No.289/16 ALM from 01 to 30 May 2019 at ZKC Sarabha Nagar Ldh. 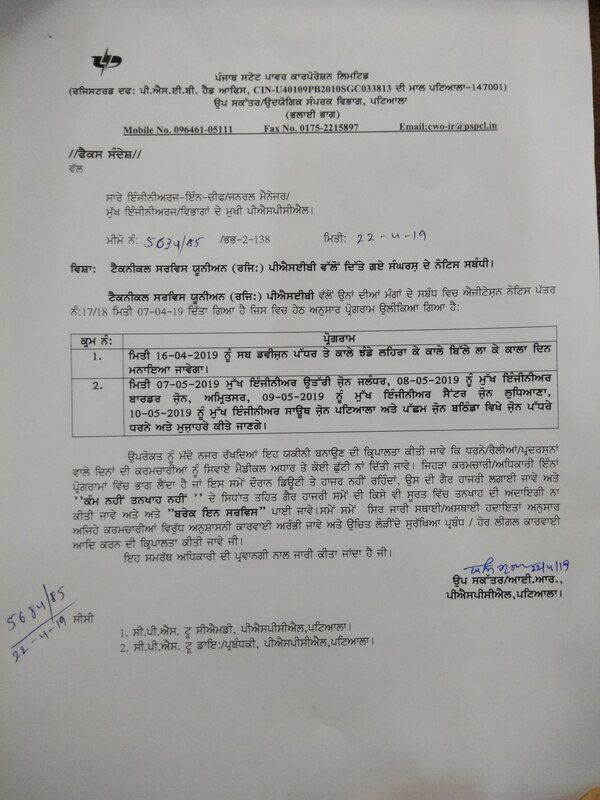 - 23-Apr-2019 D-10449-347 Reg.amendment of suspension period 19.06.14 to 19.08.14 of Er.Harinderjit Singh A.A.E. - 18-Apr-2019 ENG-1-273 Posting orders of Smt. Kusam Lata, Senior Asstt. - 16-Apr-2019 gen-1-25162 Using Logo to celebrate 150th Anniversary of Mahatma Gandhi Ji.